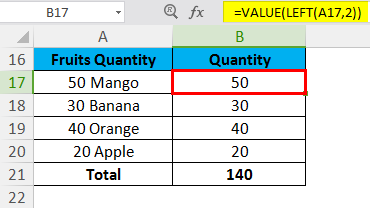 VALUE in Excel (Formula,Examples) | How to Use VALUE Function? How to Use VALUE Function in Excel? 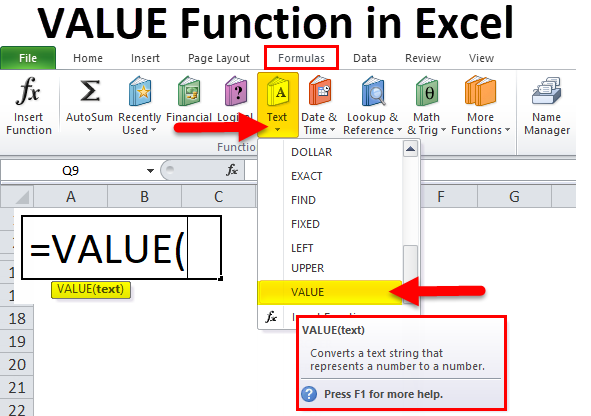 Value function is categorized under text function, it is a convenient feature of excel, Value function is a base function of excel, it converts a text string from number to number, text string can be in any type of constant number, date and time format, if the value of text is not one of these formats then its value return #value error value, because value function does not understand the value. 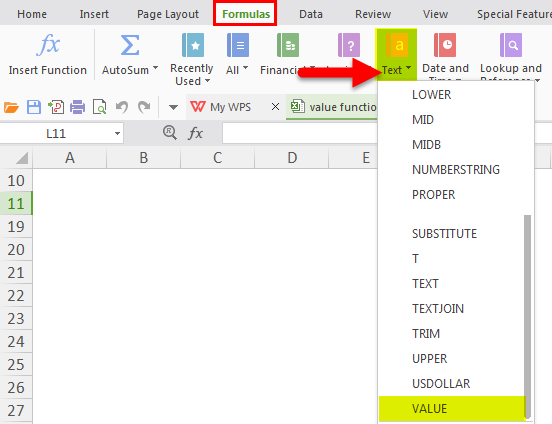 Generally, we don’t need to use the value function in formula, as the utilization of this formula is very few because excel automatically converts text to numbers as necessary, also excel gives a tool to convert the data type by the help of text to column tools. We come to know because it will show a green mark in the cell. Our data in text format should be in numeric value and we have huge data size and we need to calculate on the data like sum, subtract, multiplication, division, average, so you need to use this function because no calculation will perform as expected, especially when you are trying to run them on data from an external source consider running your input columns through VALUE to ensure that Excel is appropriately recognizing them as numbers. This function also plays a very important role when we are using the advanced excel formula because there are uses of data type, without data type numeric value excel cannot be understood properly, thus we might get the incorrect result. There is only one argument in VALUE Function which is mentioned below. Value (Required Argument / Text Value) – It is the text enclosed in quotation marks or a reference to a cell containing the text you want to convert. Choose Text to open the Function drop-down list. We get a new function window showing in below mention picture. Then we have to enter the details as shown in the picture. Put the Cell value or text value where you want to convert the data type. 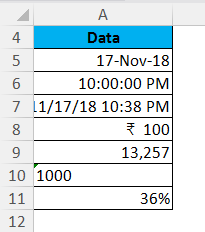 Click on the cell where you want the result from value then put the formula as mentioned below. 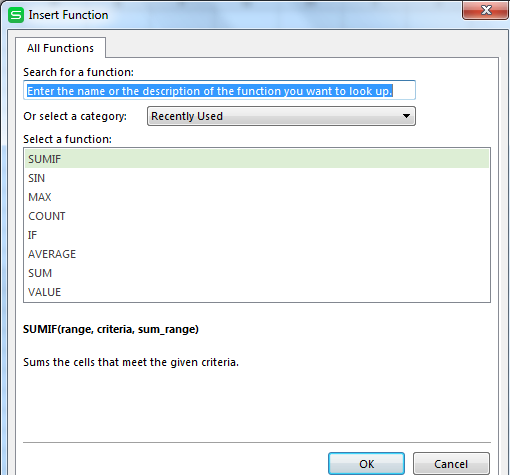 Value Function in Excel is very simple and easy to use. 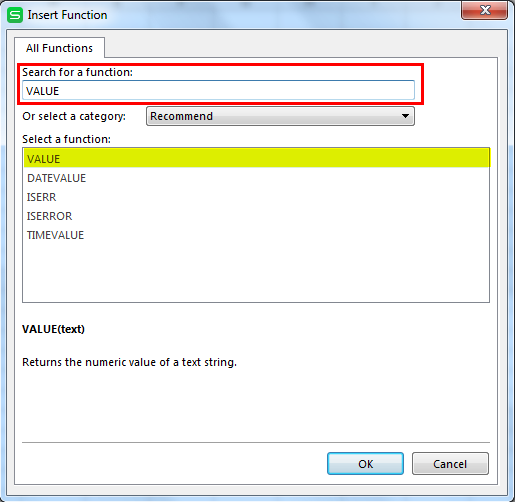 Let’s understand the working of Value Function in Excel by few Examples. Like the above image, we have few data which is different like date, time, currency, numbers, numeric in-text value, and discount percentage, we can see below in value function how to convert all the data as numeric value, then you can easily make any calculations on the result value, now we are using value function formula below. There are some details of calling agent in a call center as shown in the above table. Agent Name, Agent first log in time, Log out time, and total log in duration on the system then we check with a formula that which agent has not completed the login duration, so we can use the IF Function to check the same, in this formula we take the help of value function, because we are giving the timing criteria in text format and we are using the IF Function with value function, value function converted in time format which is given in the criteria in text format. Now we can get the result as below mentioned with the help of the value function with IF Function. 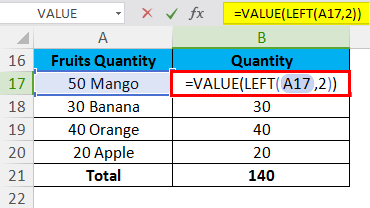 As shown in the below picture there are names of some fruits, quantity and we want to know about the total numbers of fruits so we can get this using of value function with left function. Now we can get the result like this. If the data is not in a format that Excel recognizes, the data can be left as text. When this situation occurs, certain functions, such as SUM or AVERAGE, ignore the data in these cells and calculation errors occur. A VALUE formula returns the #VALUE error. You can also track the data type by alignment, Text data aligns on the left in a cell. Numbers and dates align on the right cell. The function converts text that appears in a recognized format (a number in the text, date, or time format, currency, percentage ) into a numeric value. Normally, Excel automatically converts text to numeric values as needed, so the VALUE function is not needed regularly. 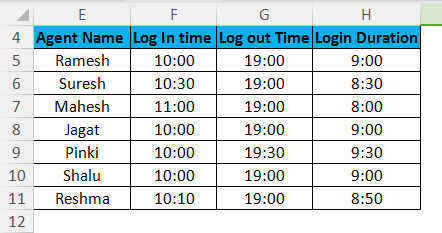 How to Use LOG Function in Excel?